A new graphics card featuring 896 CUDA Cores, 14 SMs, 4GB of video memory and a maximum frequency 1,560 MHz has appeared in the GeekBench database as revealed by renowned leaker TUM APISAK. This rumored GPU has only been identified as a “Graphics Device” created by the Nvidia Corporation, but it safe to assume it’s built upon the Turing architecture and it will likely be the new GTX 1050 (Ti) replacement as it only features 4GB of video memory. It also seems that our mystery GPU scored 114,206 points in OpenCL that’s remarkably higher than the existing GeForce GTX 1050 Ti’s result of around 84,000 points. In the same tweet from TUM APISAK, GeekBench records also point to the existence of an upcoming GeForce RTX 2060. What’s more, the supporting documentation seems to confirm the GPU will feature 1920 CUDA Cores, 30 SMs, 6 GB of GDDR6 memory and a maximum frequency of 1,200MHz. According to the benchmark page, the GeForce RTX 2060 has also scored 211,876 points in OpenCL, which supposedly puts it ahead of the GeForce GTX 1070 Ti that scored only 175,000 points. Now this all lines up with what we’ve come to expect from Nvidia’s new RTX lineup – seriously bumped up specs and scores – but new reports in the rumor mill have been pointing to the existence of a separate Nvidia GTX 11-series. 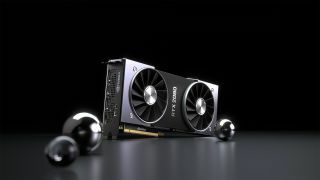 Multiple sites (including Wccftech and Videocardz) have reported that this GTX 11-series would be an extension of the Turing line that forgoes the inclusion of ray tracing RTX cores. This would purportedly lead to a second line of more affordable GPUs that will be begin with the GeForce GTX 1160 and 1150. Before we buy too much into these reports, we wanted to remind you that this current line of GPUs was already rumored to be the GTX 11-series before Nvidia pulled the rug under all of us and introduced the RTX 20-series. So this is ground we can’t imagine Nvidia would want to retread unless it really feels threatened by AMD’s upcoming line of 7nm Vega II GPUs. However this shakes out, we’re sure to know everything Nvidia has planned as all will likely be announced at its CES 2019 press conference.